Paul Ryan on Tuesday disavowed Donald Trump’s attacks on a federal judge over his Mexican heritage, but suggested he was a better option than presumptive Democratic nominee Hillary Clinton. “Claiming a person can’t do their job because of race is sort of like the textbook definition of a racist comment,” the House speaker said during a Tuesday press conference. Trump claims Curiel, who is presiding over two cases involving the Manhattan businessman’s now-defunct Trump University, cannot be impartial because “he’s a Mexican.” Trump cited the fact that he is planning on “building a wall” along the US-Mexico border. Republicans from all corners of the party have criticised Trump for the racially charged attacks. 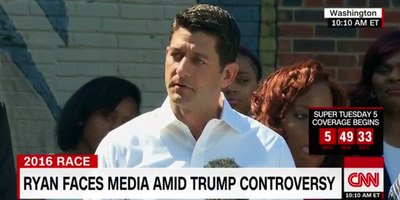 That includes Ryan, who distanced himself during a Friday interview, just one day after ending a month-long standoff over whether he would endorse the bombastic real-estate magnate. Ryan added that he and Trump have “more common ground on the policy issues of the day.” And he suggested he’s much more likely to get progression on his agenda, which began rolling out Tuesday, in a theoretical Trump administration than in a Clinton administration.